>> Do Skin Tightening Creams & Skin Firming Products Actually Work? What are Skin Tightening & Skin Firming Creams? Nowadays it isn't uncommon to see cosmetic products that claim to "firm" or "lift" the face and skin. This group of cosmetics is commonly known as skin tightening and skin firming creams and lotions. So you can think of any lotion that makes the claim to firm your skin or make it tighter to fit into one of these categories. The main problem with these cosmetics? They often are 99% hype and marketing and 1% effective. This may be bad news is you were hoping to find a skin tightening cream to help reduce the inevitable decline and youthful appearance of your skin! But don't get down because there are actually some skin firming creams and skin tightening serums that actually do work which we will discuss below. The trick to finding these products is searching out only high quality products that not only contain the right ingredients but ones that contain ENOUGH of the right ingredient. The VAST majority of skin tightening creams do NOT work. Most skin tightening and firming creams and serums do NOT actually work. Does that mean that all of these creams and serums are useless? But what it does mean is that you need to be careful what you purchase and look for certain ingredients. The cosmetic industry is not as tightly regulated as other industries such as the pharmaceutical industry. If a pharmaceutical company says that a medication or drug lowers blood pressure they have to prove that claim with rigorous clinical studies. This check and balance does NOT exist in the cosmetic industry. Because the industry isn't regulated pretty much any product can make a claim that they want. In addition they are not required to disclose how potent or how effective a product actually is. So some products may contain the right ingredient (let's say ascorbic acid in this case), but they won't disclose that the concentration is 0.1% when it really needs to be about 20% in order to be effective. All of these factors are important when considering which products to buy or which to pass on. So how do you know if you are using or looking at a high quality product? The ingredient list will tell the tale! High quality products are not afraid to list all of their ingredients and they aren't afraid to list the concentration of these ingredients. If you are having a hard time finding the ingredient list or the concentration amount then whatever product you are looking at is probably trying to hide something! Niacinamide - Niacinamide is a B vitamin that can be formulated and placed topically on the skin. Not only does niacinamide help keep the skin looking younger it also helps to improve the elasticity of the skin, helps reduce wrinkles and may even out skin tone and complexion. Just 12 weeks of a 5% Niacinamide product is enough to show significant and noticeable improvements to the skin. Retinol - Retinol is a Vitamin A derivative that can be placed topically on the skin and may be one of the best vitamins you can use on your face. Retinol has been proven to reduce fine lines and wrinkles and even reduces photo-damage from the sun (another cause of aging skin). Retinol has also been shown to induce the production of glycosaminoglycan which helps your skin remain plump. Natural Anti-oxidants - The world is full of anti-oxidants that can help reduce the natural aging process by binding to and eliminating free radicals. Anti-oxidants are often naturally found in plants and many vitamins can act as anti-oxidants as well. You can think of anti-oxidants as scavengers that naturally help keep your cells working properly and fight off damage from the sun. They are found in Vitamin C, E, A, B3 and in most botanic based ingredients (plant based). Ascorbic Acid - Ascorbic acid is a formulation of Vitamin C and it is another very powerful ingredient. Vitamin C helps tighten the skin, reduce hyperpigmentation and clear up the complexion. The trick to using Vitamin C is to find it in the right concentration (up to 20%) and at the right pH. Low quality formulations do not work well. Zinc Oxide - Zinc oxide helps to block ultraviolet radiation and therefore damage to the skin. So while this ingredient doesn't necessarily help tighten the skin it does help PREVENT skin sagging from photo-damage over time. It should never be used by itself, but it should definitely be a part of any complete skin care regimen. Products that naturally exfoliate such as alpha hydroxy acids and beta hydroxy acids - Exfoliators help to stimulate the growth of collagen which helps build up and strengthen the integrity of the skin. These exfoliators include ingredients such as glycolic acid, salicylic acid and so on. Like Zinc oxide they should not be used by themselves for skin tightening but they can be used with the other ingredients listed above. Do you need to find a product that contains ALL of these ingredients in one? In fact I'm not even sure such a product exists. But what it does mean is that you should find a product which contains at least ONE of the high quality ingredients listed above. And make sure that the product does not contain any knock off ingredients which are often cheaper to make than the real ingredients. Fortunately (or unfortunately, depending on how you look at it) the list of products to avoid is MUCH longer than the list of products that are actually beneficial! If the products listed on your skin tightening or skin firming cosmetic product does NOT contain any of the ingredients listed above, then there's a good chance it probably won't work. Avoid any product that claims to have "instant and lasting skin tightening"
The most important thing to be cognizant of while searching for high quality products is to avoid all of the hype and marketing that companies use. They tend to have overall moderate reviews and they tend to cost more and you actually want both of these things. Not all skin care products will work for all skin types! So on average cosmetic products will not work probably 20% of the time. If you see a product with 100 5 star reviews then you can count on most of them being fake because this just isn't realistic. Aside from using skin care and cosmetic products there are also other things you can (and should) be doing to help improve the quality of your skin. Consider the use of bio-identical hormone therapy - Hormone therapy such as estrogen replacement (and progesterone replacement) can plump up the skin and reduce the signs of aging. If you are menopausal then you can discuss this option with your doctor. Remember that even if you do decide to use a skin tightener cream make sure that you ALSO use these strategies as well. They will only add to and improve your results further. The quality of your skin is a product of what you put INTO your body and also what you put ON your skin. As I mentioned previously in this post you will find that most products that don't advertise to be "firming" or "tightening" creams are actually the best products. It's counter-intuitive, I know, but it's how it is! Below I've included some of the best products that fall into the "products that actually work" category due to the ingredients that they have. 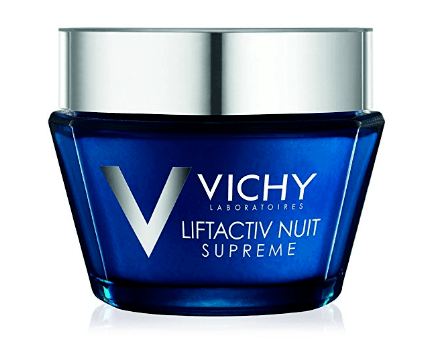 #1 on the list is a "Liftactiv" cream by Vichy. It contains the combination of Vitamin C (ascorbic acid) and another simple sugar known as Rhamnose. While Rhamnose is less well studied than Vitamin C, they still do work quite well together. This cream is primarily designed to be used at night and may work better around the upper face including the eyes. Second on the list is an anti-aging and anti-wrinkle cream which can be used on the entire face (if that is what you are trying to firm up). It can also be placed on the neck, back of the hands and around the face (if these are your problem areas). This product contains the combination of Vitamin C (ascorbic acid) but this time it comes with hyaluronic acid which helps moisturize and plump up the skin. Vitamin C creams are very effective but so are Retinol containing creams. Remember when you decide which one to use that one is not necessarily better than the other. In fact Retinol and Vitamin C products compliment each other PERFECTLY. If cost is not an issue (and you are serious about firming and tightening up your skin) then you should consider the amazing combination of Vitamin C with Vitamin A (retinol). You can consider Retinol, Vitamin C and Niacinamide as ingredients that all carry about the same amount of weight in terms of how effective they are. So you really can't go wrong in choosing one over the other. But even if you find one that works don't be afraid to switch up to another product and alternate through them on occasion. This helps you determine which products work best for YOUR skin. I've written extensively about the benefits of Retinol, so if you want to learn more about how Retinol works you can check out this post. Products that contain niacinamide can also be helpful for improving the overall quality of your skin. While these products definitely may help it might be worth a trial of Vitamin C and Vitamin A first before you jump into niacinamide. If you already have a retinol product (and/or a vitamin C serum that you use) then you may want to trial this product in combination with what you are already using. Does the product that you choose need to be specialized for a certain area of your body? One trick that you may find helpful is knowing that you can apply Vitamin C, Retinol and Niacinamide to other parts of your body such as your neck, face, back of the hands and so on. These products are usually marketed as being used for "under the eyes" or "around the lips" or so on, but that doesn't mean they HAVE to be used in those places. The skin in your neck can still absorb and utilize the nutrients in these products just as well as the skin under your eyes and around your mouth! So just remember that you can and should use these products on the trouble areas that you want to target. Will these products and serums work for skin tightening after weight loss? The long answer has to do with how the sagging skin is created after weight loss. Aging results in a natural decline in collagen and elastin in the dermis of the skin which reduces the texture and quality of the skin. Skin sagging after weight loss is the result of stretched skin which is a completely different mechanism. By far the most effective treatment to tighten skin after weight loss is to use cosmetic procedures such as cool sculpting, radio frequency and surgical removal of excess skin. Other therapies such as fasting may also help to tighten the skin. But I don't recommend the use of these products on extra skin if it's from rapid weight loss. Is there anything else that you can or should be doing in addition to using creams, serums and gels? By far the easiest (and cheapest) way to firm or tighten your skin is with cosmetic products but there are also other ways to tighten up your skin. These procedures range from $50 per session all the way up to thousands of dollars per session (CO2 laser). The idea here is that the more money you are willing to spend the faster you will achieve the results you are looking for. But before you think you need to use laser therapy to tighten your skin consider this! Sometimes undergoing 6-8 sessions of microneedling in combination with cosmetic products listed above may be enough for you to notice a significant improvement in your skin. So make sure you find out what works best for your budget and your time frame and then go with that. It is definitely possible to tighten and firm up the skin around your face, eyes, neck and other places of your body. When you look for products make sure you avoid products which make claims that seem too good to be true. If you avoid those products and stick to products that contain Vitamin C, Retinol and Niacinamide you will be much better off long term! As always, make sure that you tailor the products you use to YOUR skin and make sure to combine cosmetic products with lifestyle changes for best results. Are you using skin tightening or firming creams?